Ultanya: Tales from the Game Tavern Giveaway! Tales from the Game Tavern Giveaway! 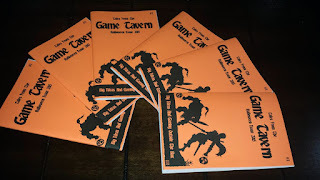 Tales from the Game Tavern issue #1 was launched with a giveaway contest for the original cover art by Ike Horton Arts. Every dead tree copy purchased during the month of October counted as a raffle ticket. This morning I used a random generator to select a winner and Christopher Hardy will be the proud owner of Smite or Treat! Congratulations Chris, we hope the painting finds a display place in your gaming area and that it inspires you every Halloween! When originally designing the first issue I was not sure what to expect in terms of the community. The response was wonderful and I’m happy to report I have begun working on issue #2. That being said the creation of any publication is a big learning process. No matter how many times you proof read a few typos are bound to slip through. To that end I have six copies of issue #1 with minor mistakes I will be giving away! 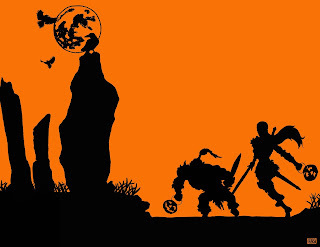 To be entered in the giveaway respond to this post with what Halloween themed gaming you did during October. If you did not have a chance to roll any dice this year than a past experience is fine also. One entry per person! Because of shipping costs this giveaway will only be open to US entrants. I will use a random generator to pick the winners on the 12th of November. Good luck! Finally I just wanted to thank Ike Horton for not only creating the amazing cover of issue #1 but also donating the original to the launch raffle. 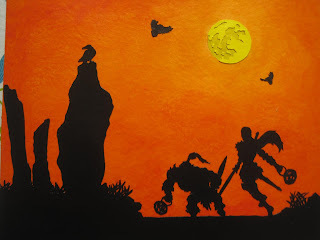 If anyone needs paper cut art Ike is the guy you should be contacting. Not only does he have amazing talent but he can visualize exactly what you are looking for. Check out some of Ike's other work here!